And all the girls say I’m pretty fly for a white and black sixteenth century construction technique. 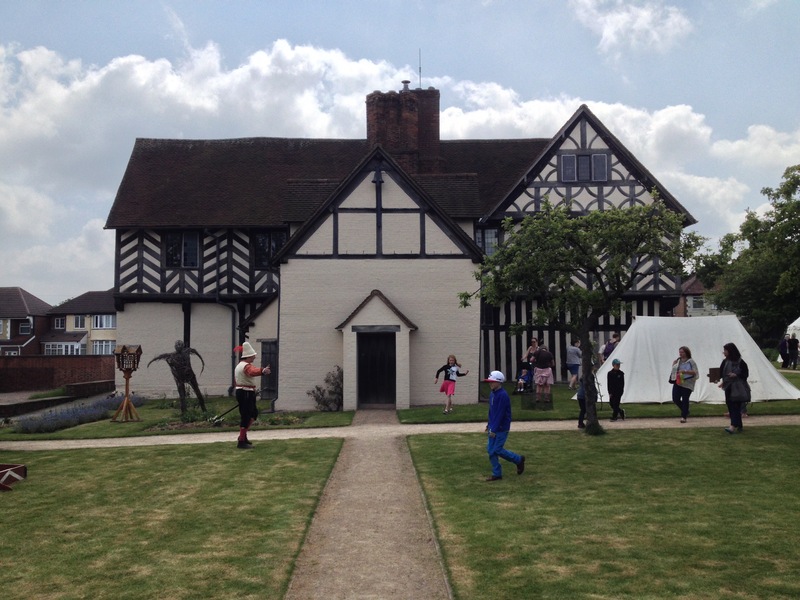 Blakesley Hall is a classic late Tudor crib in Yardley, showing mad skillz in oak framing construction. According to my guide, the building was made up in frames on the ground which were then tilted up and pegged into each other. Which must have been tricky, considering how irregular the elements are. 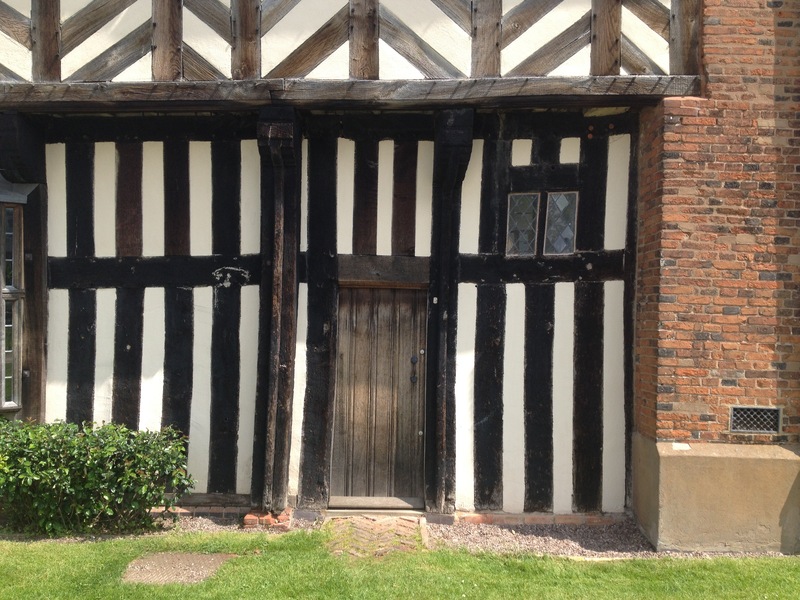 Once the big oak frames are up, wattle (woven split timber laths) are woven into the gaps and covered with horsehair plaster which is then painted white and the timbers stained black, making the striking and beautiful patterns on the outside. Look carefully at the patterns. They are not random, but the happy congregation of artist and engineer. On the ground floor the beams are packed close together. This is partly a demonstration of wealth, but also responds to the additional load. The floors are fixed into the uprights and project by about eighteen inches or so. Because the timbers are joined by cutting a slot (the mortice) in the receiving piece and a precise projecting tongue (the tenon)on the end of the joining piece, we can’t have the joints in line – we have to break the pattern so that the mortices don’t weaken the pieces and the tenons don’t interfere with each other. The ground floor wall tenons fix into the floor beams of the first floor. 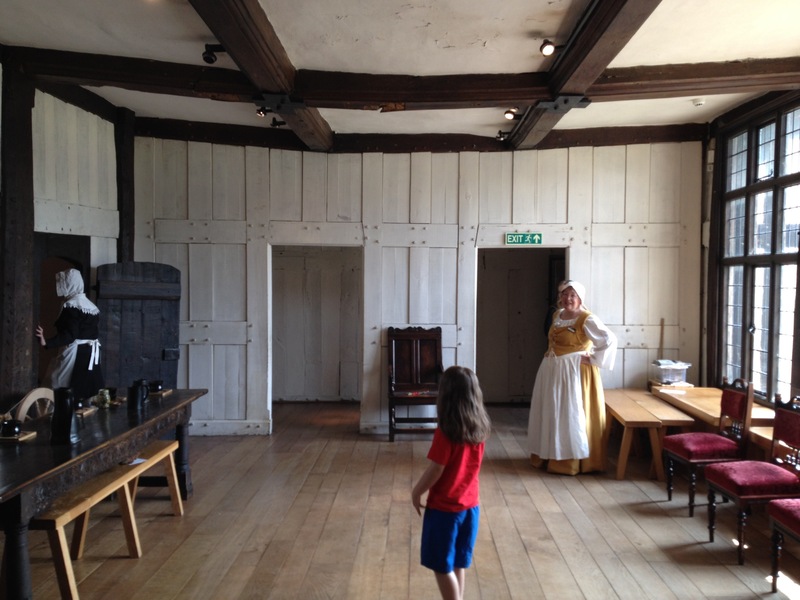 The floor plate (the horizontal beam at the base of the timber wall) is joined onto the ends of the floor beams and the next wall is built off it. The uprights can’t line up – when they do, at the corners, we need extra reinforcement. 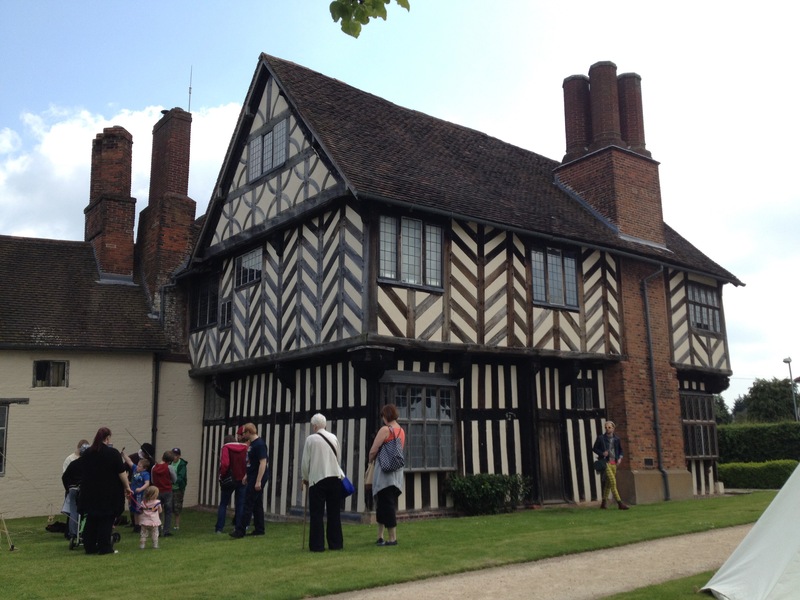 Above the ground floor, where the posts are so close together, we have bracing – herringbone (mirrored diagonals) at the first floor and split semi circles at the attic storey. Nice. As a Victorian architect I like to use vintage equipment. Like pens. Drawing by hand clears the mind and details often just resolve themselves with a series of quick sketches. They don’t have to be beautiful, but they often end up that way just by focusing on what joins to what, where and how. Thus one was sent to a door manufacturer. By email. I can do that too, when I want to. The client of this scheme has a small house with small rooms and now, a small family. He and she want a large family room where “everything happens”. 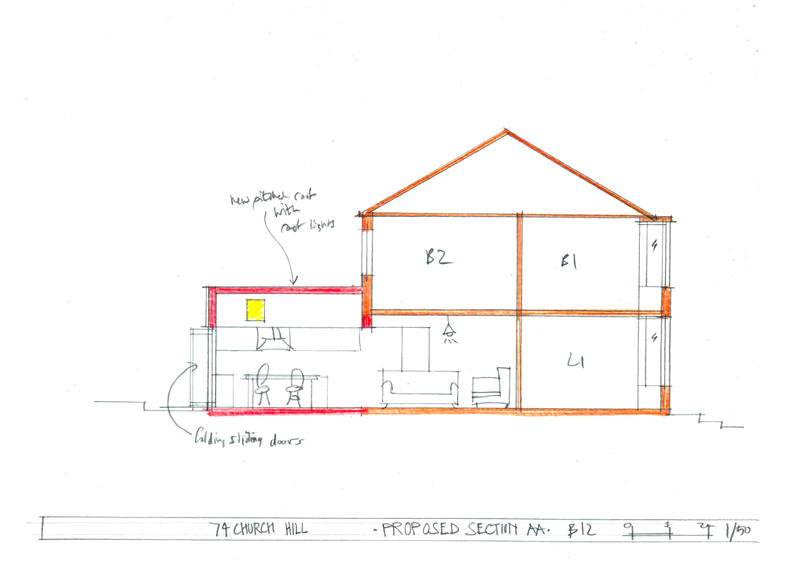 We can go back 4 metres under permitted development because it is a detached house, so we get space for an open plan kitchen with a little island facing onto a sunny dining area with folding sliding doors to the garden. We can keep living room 2 as a snug sitting area – but I think they might end up with the table round the corner and toys spread out on a rug by the window. The space is quite big and a bit raggedy for my liking on the ground floor, so I wasn’t really happy to have a flat ceiling throughout. We are using a bit steel anyway to support the external wall at the first floor above the new opening, so I have opted for a double pitched roof over the new extension. This will articulate the space (that’s show or say the idea – in this case the idea of the room as a space with distinct parts. I am not super keen on architect-speak) and give a nice feeing of entry and arrival when we come in through the door from the hall. Why? Because inside we will get two vaults (sloping ceilings going up) with roof lights facing south and north. A bit more air, a bit more light – nice. 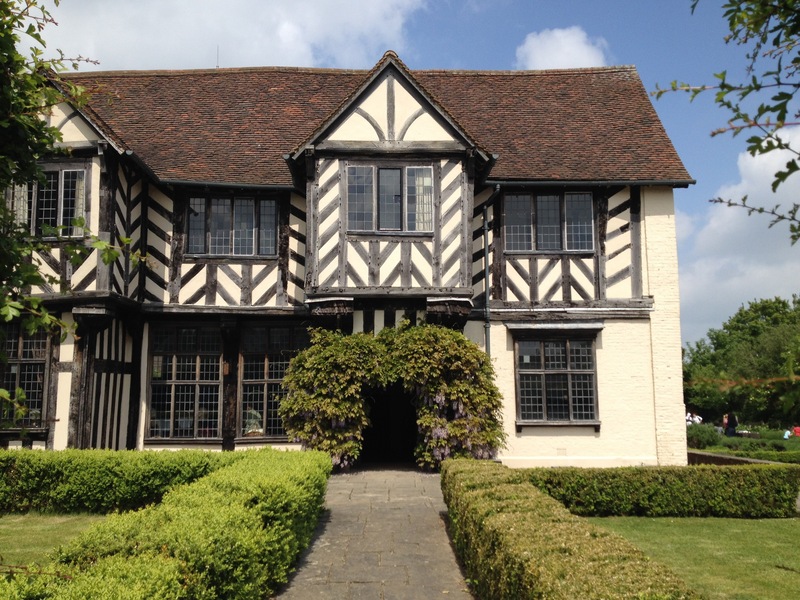 Notice that the height of the roof is not too tall – we don’t want to bump into the bedroom windows. 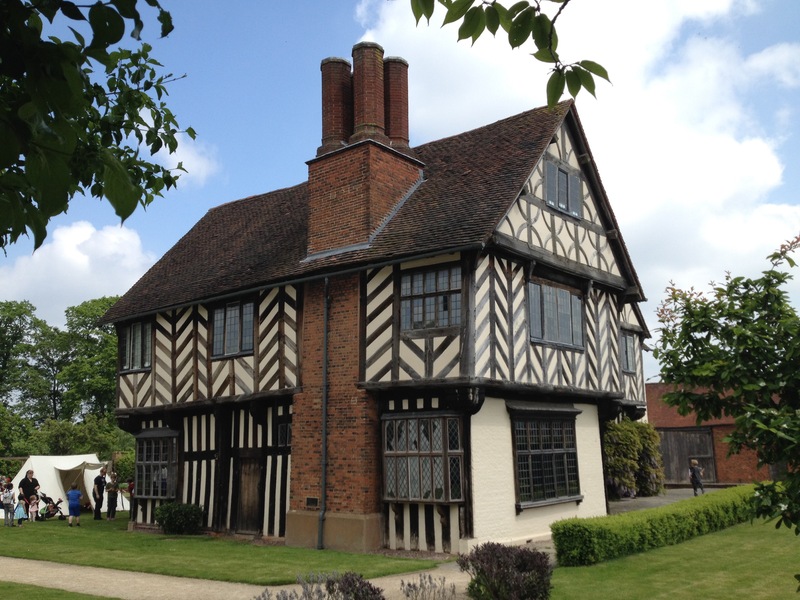 For the elevation, we get two gables – so much nicer than a horizontal line. You can also get an idea of how it feels to look up, or to sit down or roll around, with all that air above you. Nice project, I am happy! One other small thing – the pitched roof is a good place for the south facing photovoltaic (electricity generating) solar panels, if the client wishes to have them. Working, as I do, with Edwardian and Victorian terraces, I see a lot of subtle variations in the typology of these houses, but the overriding concern for their original designers is this: how to get as much house as possible into a plot that is between 10 and 15 feet wide – that’s about 3.0 to 4.5m. 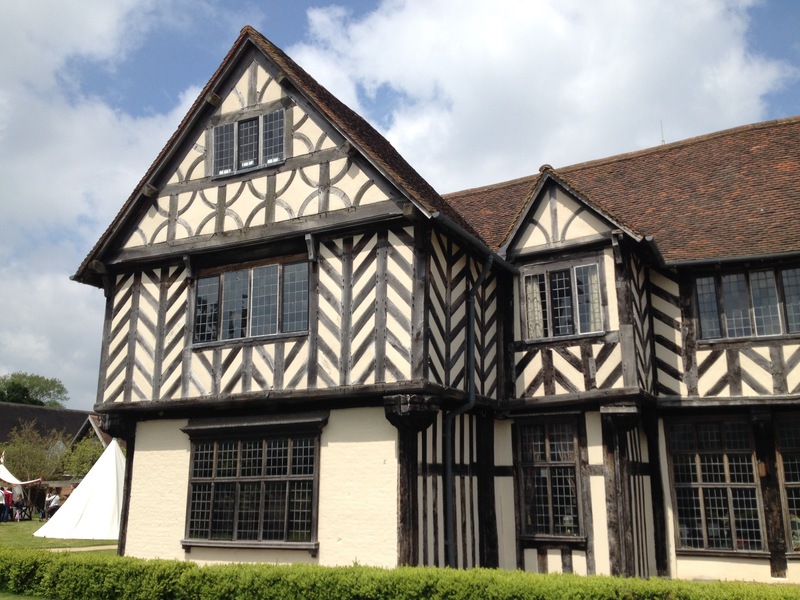 This beautiful but tiny house is one of a set of four, facing onto Kings Heath park. They have a front room, back room and stairs in the middle. The stairs are super steep, so they finish with a landing at the first floor about 18″ (about 450mm) short of the party wall (brown plan). In front and to the left is another super steep winder stair turning all the way up and back into the attic (blue plan). Because the stair run is greater than the width of the house, the designer has found some extra space: The attic stairs go over onto the neighbour’s side of the house. 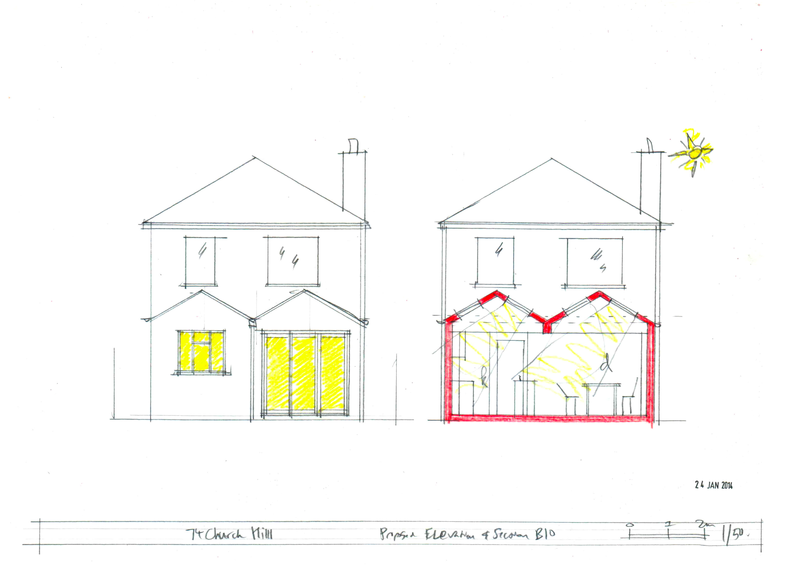 The designer has split the space between the double chimneys between the houses, with the garden half going to this house and the front half going to the neighbour. 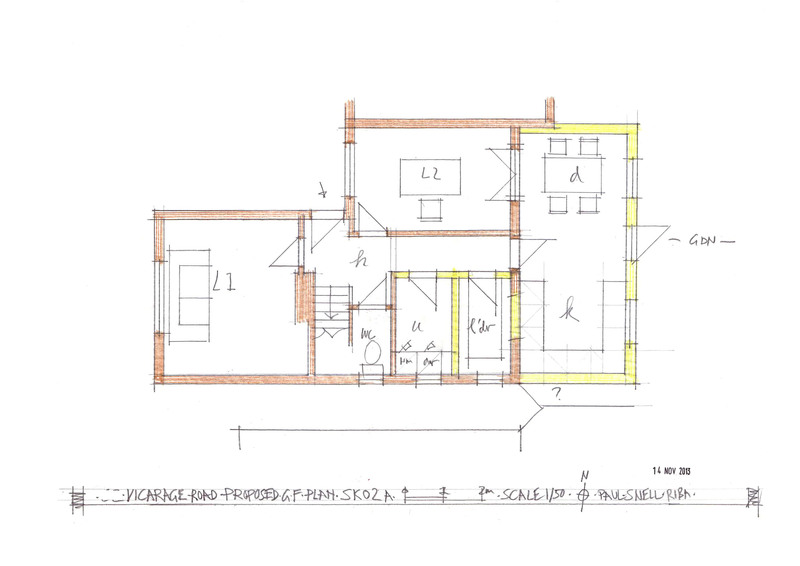 This is the most dense and critical part of the house plan and the walls, steps, doors and turns are all squeezed super tight. Not that they feel intruded upon, like a door too narrow for the body, but the elements are compact and without any wasted inches. The edges of the first floor landing are bounded by the Bedroom 1 door, the top riser, the Bedroom 2 door at an angle, the first tread to the attic and 18″ width of the wall carrying the neighbour’s stairs. In Bedroom 1, the wall runs level with the chimney breast – because behind it are the neighbour’s attic stairs. If you check back to the Ground Floor plan, you will see that we are above the alley, so this wall can run all the way down to the ground. 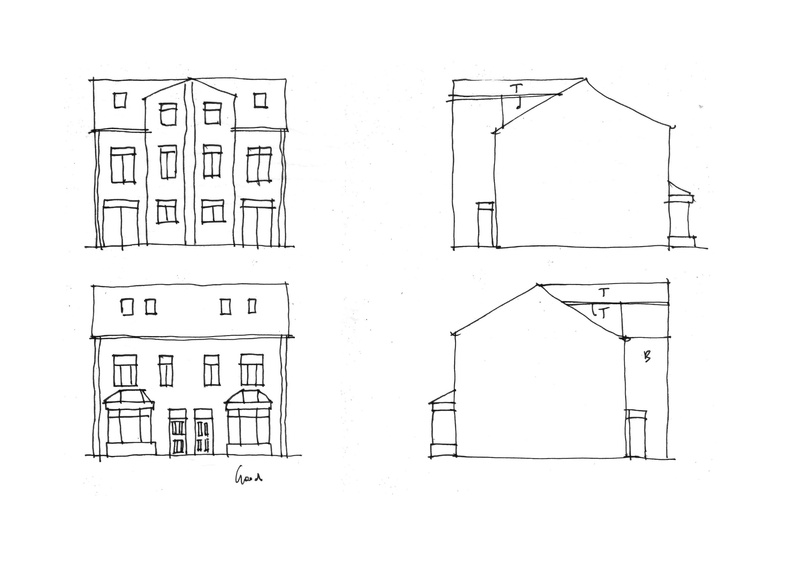 Sketches for a scheme of two houses. This is a good sketch, as far as I am concerned. The first floor stairs come out on the attic level into the tall rear wing, which also houses a little bathroom. There is no dormer to the loft room, the eaves are used as storage rooms. The main bedroom at the first floor is the biggest room, but because of the way the windows are placed, the house could be made into a compact (!) four bed, or you could include a little office room facing the street. For pretty much all of my professional career I have worked at a desk with a computer. It’s just how architects work these days. Especially on larger projects, where surveys and engineer information comes in by email in a CAD format (“computer aided design” – the “computer” bit is true). Employers (I mean the people who paid me, not the people who paid them) like to see nice hard lines, data on the server. It’s easy to retrieve and transmit, plus if different people work on it, it sort of looks the same. Same title blocks, same fonts, same library elements (cars, tables, toilets, people). You can also build up a body of details that sort of work with different projects. But if I think back to my student days I did almost everything by hand on paper: there’s no printing to worry about, you can erase mistakes fairly easily, you can collage, annotate, watercolour, glue on photographs, mix trace and paper. Mix hard line with freehand. Draw people doing stuff in your pictures. Add stuff. You can work without a computer, you just need a table and some simple tools. You can also work very fast if you need to – which you always do. When you have to make a presentation, you just roll the drawings up into a tube, go to school and pin them to the wall. No queueing in the print room with a copier card hoping to meet the deadline. It’s painful to watch people late for a presentation pinning up fresh prints that look unfinished. I have seen some amazing computer drawings, but they take a real skill and lots of time (fancy paper and lots of memory help too). Most computer drawings have a very dry, or a very messy look about them. To beat this, you need to work with more than one programme – you draw the hard line in CAD, then export to Photoshop to add graduated colour, sky tones, people, cars etc. It takes time but looks great, especially if your original is a 3D with shadows. But you get a not so easy to edit file format and for the customer it’s a lot of money for two or three pretty images. The real value of hand drawing for me is something more than just the convenience and flexibility. 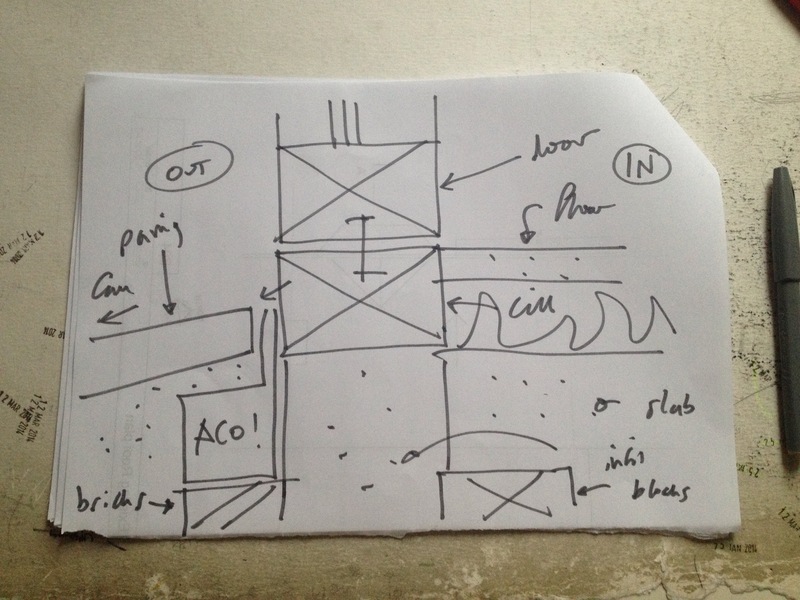 When I draw by hand I get absorbed into the project and I begin to think of all the things that might be important to the client but that a CAD programme can’t readily include – light and shadow, access, text, questions, furniture, swirly shapes – that sort of thing. As the drawing appears I can see the whole thing at once and the elements within their context. The relationship between the small and large elements, the proportion, present themselves to me. The spaces tighten up or push out as their needs require. 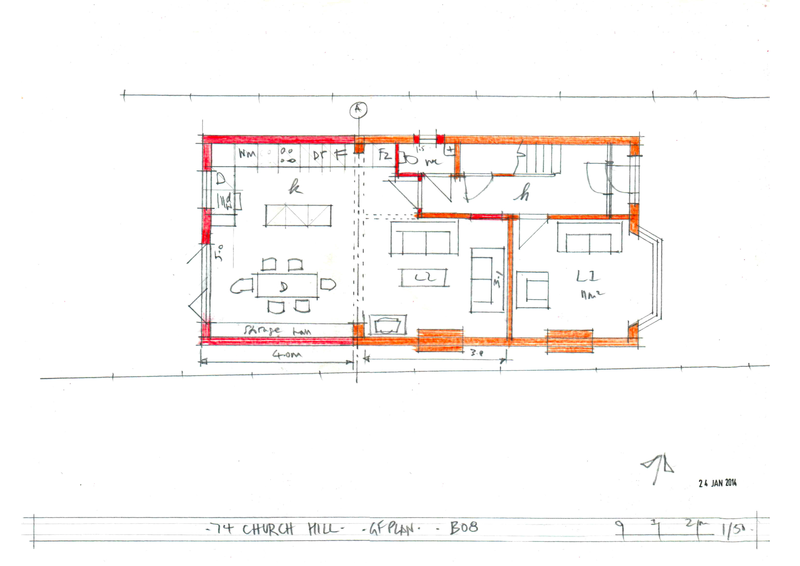 The hand drawings impose a kind of subtle accuracy on the project which is often lacking in computer drawn schemes. Before I know it, an hour or two has passed and the scheme has come to a higher state of resolution. My colleagues used to wonder why I had my own T square and masking tape and my desk, but I found it so helpful to resolve a detail or work out an elevation. Now I can draw whenever I like. I still use a CAD package for the final design work, but one day I am going to draw a whole project only by hand. Bite me! Author kingsheatharchitectPosted on November 14, 2013 Categories Architecture, shop talkLeave a comment on Pencil pencil. Sharpen sharpen. Birmingham is a city with a lot of city street feel. Every city, and many city districts, have their own city street feel. In much Kings Heath we have narrow streets of bay fronted brick terraces hard to back of footpath or with tiny front gardens. Or we have big gabled semis with arts and crafts features fronted with big old street trees. It is not just the houses that form the street feeling but the road, the footpath and the way the houses relate to it – the footpath materials, trees, grass verges, gardens and garden boundaries or no gardens. Most streets have a rule or pattern. Every so often we get a street that is a bit different or even very different. I went to see an enquiry on Green Road B13 a few months ago and I took some photographs as the street changes from one thing to another. In fact, Green road is nothing like a city street. It starts at the top like a passage between the back gardens of the big houses on Wake Green Road, works it’s way down past an eclectic collection of houses, some set back from the street, some at strange angles, down to a ford across the river Cole with a footbridge that is neither country nor town. Municipal street furniture sits beside rural views across fields. Especially interesting is the relation between houses and highways. Sometimes there is a footpath, sometimes none. There is a stretch with large lawns beside the highway which residents use for parking in between. Some houses have created interesting terraces that demarcate private from public, others have walls to screen out the street. A witches cottage with a street lamp behind a white picket fence, a 20’s house hidden behind trees. There is overgrown foliage, a line of cobbles, or a brick wall built around a tree from another time. Magic.